This photo was taken on June 1, 2013 at 3:58pm. 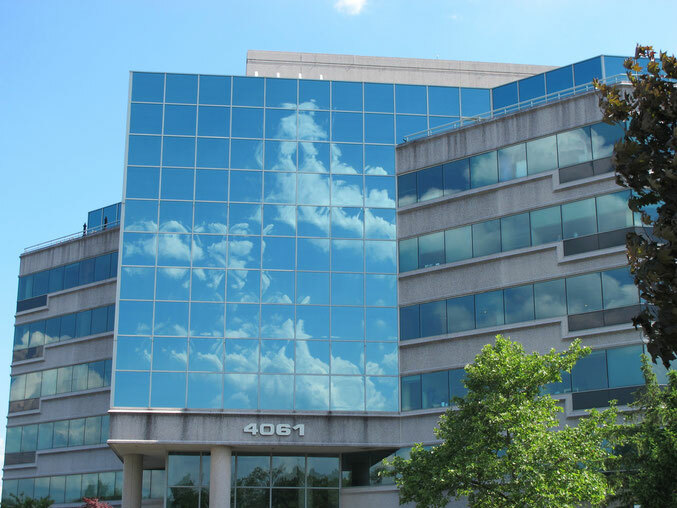 The location was in an office park in College Park, Maryland. The "Take It!" came from my driving out of a parking spot and looking up beyond the street level where I was stopped at a stop sign. What caught my eye was this almost perfectly proportioned stretch of glass that reflected the clouds with a grid pattern in a grand fashion. There was a breeze blowing at that time so - the clouds that were up for review kept changing. I sat there for a while quite taken with what it was that I was seeing. In what seemed like a long time another car approached the intersection and I had to move on. It is definitely now on my list of look up places, especially when there is an active cloud cover. The After Take: The few that I have shown this to - they all agree - that it takes on the appearance of being a cloud theater. The fun of this is to be able to say that the theater operates during daylight hours only - lol. Another part of this photo is how different the design of this building is. It almost looks like they had a rectangle base going and someone demanded that they shove another rectangle down over the top of it. I cannot help but wonder if this odd shape (to me) serves some sort of special purpose. I guess I am going to just have to go into the building and ask what it is all about - lol. Here is the hope that for those who enjoy clouds, that they find a special vantage point - or better yet - several special vantage points to watch them from. I find it to be one of the most relaxing things I can do. Great shot of those clouds! Digital clouds. Looks like super Nintendo. What an odd protuberance from the building.